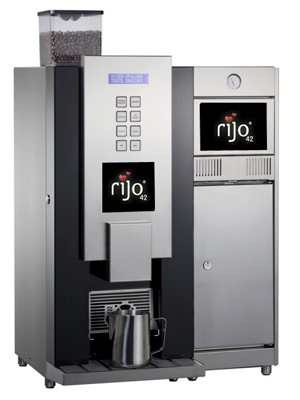 The Rio 22 Fresh Milk is a high performance, high volume bean to cup coffee machine, offering the perfect fresh milk solution for busy environments. The fully automatic Rio 22 offers up to 14 drink selections, providing freshly ground speciality coffees at the touch of a button. The machine offers the facility to dispense two drink sizes and also offers a jug function, which is perfect for meetings and events. The machine has a retractable cup rest to allow for different sized cups and jugs to be used. This high volume bean to cup coffee machine has a performance rate of 160-200 cups of coffee per hour, with an average dispense time of 25-35 seconds for a freshly ground coffee. It also produces 28 litres of hot water per hour providing the facility to make tea. The drinks menu includes Americano, Espresso, Cappuccino, Caffe Latte, Latte Macchiato, Mochaccino and Hot Chocolate. The machine features a large bean hopper with the capacity to hold 2.2kg of coffee beans, equivalent to around 200 cups. The compressor fridge unit holds 10 litres of milk, which is fed into the machine and expertly frothed by full automation. As with all of our Swiss-made coffee machines, the Rio 22 is constructed of only the highest-grade parts including a unique stainless steel coffee grinder, which is supplied with a lifetime guarantee. Other features include the Hot-Start System, a special heating system that creates perfect hot coffee from the very first cup. The Quali-Control System that guarantees optimal taste by automatically quality controlling the grinder along with automatic adjustment of grinding and brewing times. Excellent hygiene standards are achieved thanks to automatic rinsing and cleaning programmes and the Hygo-Milk System keeps bacteria at bay, ultimately reducing cleaning and maintenance. An ideal machine for cafes, coffee shops, restaurants, hotels and many more, the Rio 22 offers all of the benefits of fresh milk minus the requirement for a Barista. The machine is simple to use, clean and maintain and provides consistency in quality of drinks. Book a free demonstration of the Rio 22 Fresh Milk bean to cup coffee machine today, by calling 0800 023 4242. Alternatively, please e-mail sales@rijo42.co.uk or complete our online contact form.